Why Should I Go to the Dentist for Professional Whitening? In-office treatment uses a stronger whitening solution to achieve faster, more dramatic results. A stronger whitening gel can be used by a professional dentist, but if you buy over-the-counter products their whitening strength will be limited for safety concerns. You will leave the dental office usually within an hour with a noticeably whiter smile. Most at-home options require multiple days and even weeks of use to achieve results. Your dentist can also bolster the in-office whitening solution by using a heat source or light. This will speed up the process and make it more effective. Why Shouldn’t I Whiten at Home? Some at-home whitening products are harmful to your teeth and gums because they contain a high amount of bleach or acid. Having a professional do it for you will ensure your mouth remains unharmed. Whitening trays bought in a store can irritate your teeth and gums because they are generically made and do not fit well. Your dentist can provide you with whitening trays, but they will be custom made to seamlessly fit in your mouth without any irritation. At-home products like whitening toothpaste, rinses, and gel strips can be convenient but they will take longer to achieve results. Additionally, they can whiten your teeth unevenly leaving spots that contrast with your natural shade. Next time you want to improve your appearance, remember that whitening your smile is different than some new clothes or jewelry. 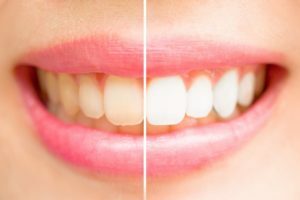 Cross teeth whitening off your “things to buy at the store” list and see your professional dentist to achieve the safest and most successful results possible. Dr. Cowell has been helping patients in DeLand achieve their smile goals for over 20 years. He provides numerous professional whitening treatments for all kinds of smiles and situations. He runs his own practice where he enjoys enhancing his patients’ smiles and confidence. For any questions you may have, he can be contacted by phone at (386) 734-8585.